This former Marine was not having a good day at work. 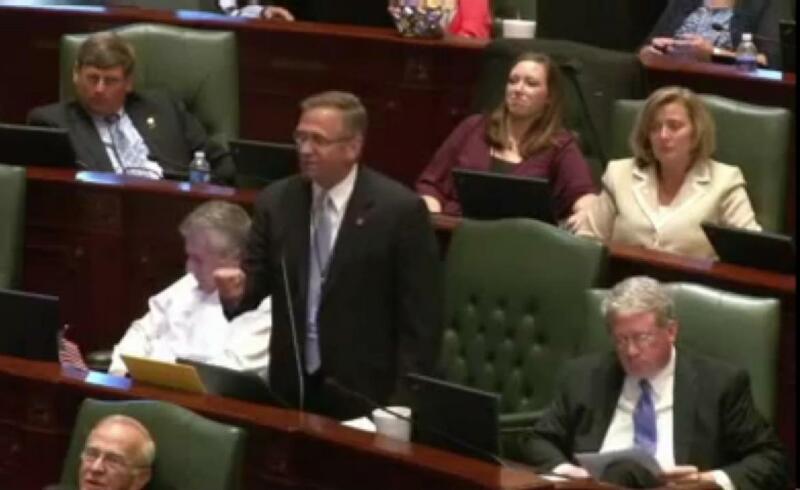 Illinois state Rep. Mike Bost was not happy Tuesday about the new pension reform proposal that hit the floor. So, looking like he was channeling one of his old drill instructors, Bost threw the bill at his colleagues and screamed at them. “I’m sick of it!” he yelled while his neighbor picked up papers that had fallen all over him. According to his Illinois General Assembly bio, Bost served in the Marine Corps from 1979 to 1982. His website states that he is concerned that Speaker Michael Madigan has too much power. His rant was about a bill that would require taxpayers to fund education pension costs. Bost was arguing that it was too long to be able to read before being required to vote on it. The real story here might go beyond Bost though. Look at these people sitting around him. It’s like the scene from an awkward dinner party that took an insanely wrong turn. Is that guy next to him really just pretending to be reading those papers? WHAT A FREAK I LIKE THAT FATSLOB LAUGHING BEHIND HIM (WHITEBOY TANTRUMS ARE CLASSIC)!!!!!!!!!!!! !